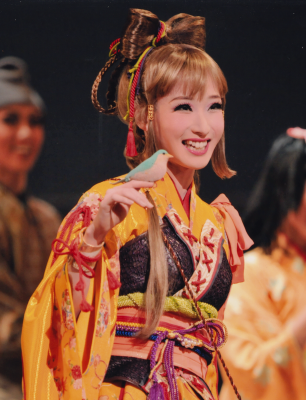 † While not lead musumeyaku roles (at the time Moon Troupe had no lead musumeyaku), both Ukifune and Esmeralda were among the top two or three most important musumeyaku roles in their respective shows. Sumireno Rei is her twin sister. Was Hankyu & Hanshin Railways' hatsumoude poster model for 2007. In February 2016, she was the subject of a photo exhibition of Hinatano Karin's at Gallery Small View. Took the exam for her high school diploma and passed in August 2018. Created by arlecchinic. Last Modification: Sunday 09 of September, 2018 15:08:34 PDT by zaraphena.